Mikhail Vasilyevich Lomonosov ( /ˌlɒməˈnɒsɒf/ ;  Russian :Михаи́л (Михáйло) Васи́льевич Ломоно́сов,IPA: [mʲɪxɐˈil vɐˈsʲilʲjɪvʲɪtɕ ləmɐˈnosəf]( listen ); November 19 [ O.S. November 8] 1711 – April 15 [ O.S. April 4] 1765) was a Russian polymath, scientist and writer, who made important contributions to literature, education, and science. Among his discoveries were the atmosphere of Venus and the law of conservation of mass in chemical reactions. His spheres of science were natural science, chemistry, physics, mineralogy, history, art, philology, optical devices and others. Lomonosov was also a poet and influenced the formation of the modern Russian literary language. Kholmogorsky District is an administrative district (raion), one of the twenty-one in Arkhangelsk Oblast, Russia. Municipally, it is incorporated as Kholmogorsky Municipal District. It is located in the center of the oblast and borders with Pinezhsky District in the east, Vinogradovsky District in the southeast, the territory of the town of oblast significance of Mirny in the south, Plesetsky District in the southwest, and with Primorsky District in the northwest. The area of the district is 16,827 square kilometers (6,497 sq mi). Its administrative center is the rural locality of Kholmogory. District's population: 25,061 (2010 Census); 30,797 (2002 Census); 35,891 (1989 Census). The population of Kholmogory accounts for 16.6% of the district's total population. Lomonosovo is a rural locality in Kholmogorskoye Rural Settlement of Kholmogorsky District, Arkhangelsk Oblast, Russia. The population is 163 as of 2010. Archangelgorod Governorate, or the Government of Archangelgorod, was an administrative division of the Tsardom of Russia and then the Russian Empire, which existed from 1708 until 1780. Its seat was in Archangel. The governorate was located in the north of the Russian Empire and bordered Siberia Governorate in the east, Kazan Governorate in the southeast, Moscow and Ingermanland Governorates in the southwest, Sweden in the west, and Norway in north-west. In the north, the governorate was limited by the White and Barents Seas. Meletius Smotrytsky, né Maksym Herasymovytch Smotrytsky, Archbishop of Polotsk, was a writer, a religious and pedagogical activist of the Polish–Lithuanian Commonwealth, a Ruthenian linguist whose works influenced the development of the Eastern Slavic languages. His book "Slavonic Grammar with Correct Syntax" (1619) systematized the study of Church Slavonic and, according to Vinokur, "became the standard grammar book in Russia right up till the end of the 18th century." He believed in the revival of the Orthodox religion in traditionally Slavic lands centered in the Tsardom of Russia. Leonty Filippovich Magnitsky, born Telyatin, was a Russian mathematician and educator. The Slavic Greek Latin Academy was the first higher education establishment in Moscow. In 1760, he was elected a Foreign Member of the Royal Swedish Academy of Sciences. In 1764, he was elected Foreign Member of the Academy of Sciences of the Institute of Bologna  In 1764, Lomonosov was appointed to the position of the State Councillor which was of Rank V in the Russian Empire's Table of Ranks. He died on 4 April (o.s. 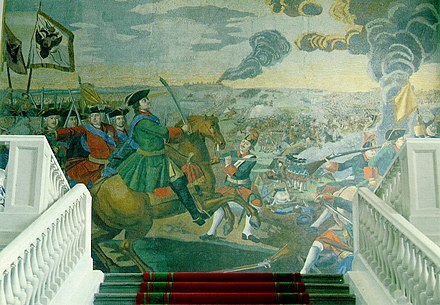 ), 1765 in Saint Petersburg. He is widely and deservingly regarded as the "Father of Russian Science",  though many of his scientific accomplishments were relatively unknown outside Russia until long after his death and gained proper appreciation only in late 19th and, especially, in 20th centuries. In 1756, Lomonosov tried to replicate Robert Boyle's experiment of 1673. He concluded that the commonly accepted phlogiston theory was false. Anticipating the discoveries of Antoine Lavoisier, he wrote in his diary: "Today I made an experiment in hermetic glass vessels in order to determine whether the mass of metals increases from the action of pure heat. The experiments – of which I append the record in 13 pages – demonstrated that the famous Robert Boyle was deluded, for without access of air from outside the mass of the burnt metal remains the same". He stated that all matter is composed of corpuscles – molecules that are "collections" of elements – atoms. In his dissertation "Elements of Mathematical Chemistry" (1741, unfinished), the scientist gives the following definition: "An element is a part of a body that does not consist of any other smaller and different bodies ... corpuscle is a collection of elements forming one small mass." In a later study (1748), he uses term "atom" instead of "element", and "particula" (particle) or "molecule" instead of "corpuscle". Lomonosov, Mikhail (2012). The Appearance of Venus on the Sun, Observed at the St.Petersburg Imperial Academy of Sciences on May 26, 1761. Translated by Vladimir Shiltsev in "Lomonosov's Discovery of Venus Atmosphere in 1761: English Translation of Original Publication with Commentaries". arXiv: 1206.3489 . Lomonosov, Mikhail (2017). Oratio De Meteoris Vi Electrica Ortis – Discourse on Atmospheric Phenomena Originating from Electrical Force (1753). Translation and commentary by Vladimir Shiltsev. arXiv: 1709.08847 . Lomonosov, Mikhail (2018). Meditations on Solidity and Fluidity of Bodies (1760). Translation and commentary by Vladimir Shiltsev. arXiv: 1801.00909 . Moscow State University is a coeducational and public research university located in Moscow, Russia. It was founded on 23 January [O.S. 12 January] 1755 by Mikhail Lomonosov. MSU was renamed after Lomonosov in 1940 and was then known as Lomonosov University. It also houses the tallest educational building in the world. Its current rector is Viktor Sadovnichiy. According to the 2018 QS World University Rankings, it is the highest-ranking Russian educational institution and is widely considered the most prestigious university in the former Soviet Union. The 2012 transit of Venus, when the planet Venus appeared as a small, dark spot passing across the face of the Sun, began at 22:09 UTC on 5 June 2012, and finished at 04:49 UTC on 6 June. Depending on the position of the observer, the exact times varied by up to ±7 minutes. Transits of Venus are among the rarest of predictable celestial phenomena and occur in pairs. Consecutive transits per pair are spaced 8 years apart, and consecutive pairs occur more than a century apart: The previous transit of Venus took place on 8 June 2004 ; the next pair of transits will occur on 10–11 December 2117 and in December 2125. Georg Wilhelm Richmann, was a Baltic German physicist. He proved that thunder clouds contain electric charge. Dmitry Ivanovich Vinogradov was a Russian chemist who developed Russian hard-paste porcelain; he was the founder of the Imperial Porcelain Factory. The Vedomosti was the first newspaper printed in Russia. It was established by Peter the Great's ukase dated 16 December 1702. 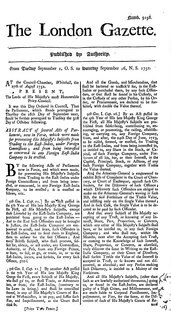 The first issue appeared on 2 January 1703. Georgy Sergeyevich Golitsyn is a prominent Russian scientist in the field of Atmospheric Physics, full member of the Academy of Sciences of the USSR since 1987, Editor-in-Chief of Izvestiya, Atmospheric and Oceanic Physics, ISSN 0001-4338, member of the Academia Europaea since 2000. 1990-2009 - Director of the A.M. Obukhov Institute of Atmospheric Physics, RAS, Moscow, Russia. He is a member of the princely house of Golitsyn. His father is the Russian writer Sergei Mikhailovich Golitsyn. Vladimir Fedorovich Chekalov was a Russian Soviet realist painter and art teacher, who lived and worked in Leningrad. He was a member of the Leningrad Union of Artists, and regarded as a representative of the Leningrad school of painting, most famous for his battle and genre paintings. The year 1952 was marked by many events that left an imprint on the history of Soviet and Russian Fine Arts. The year 1951 was marked by many events that left an imprint on the history of Soviet and Russian Fine Arts. The year 1968 was marked by many events that left an imprint on the history of Soviet and Russian Fine Arts. The year 1939 was marked by many events that left an imprint on the history of Soviet and Russian fine arts. Stepan Yakovlevich Rumovsky was a Russian astronomer and mathematician, considered to be the first Russian astronomer of renown. Mikhailo Lomonosov is an astronomical satellite of Moscow State University (MSU) named after Mikhail Lomonosov. Vladimir M. Lipunov is a Soviet and Russian astrophysicist, Professor of the Moscow State University, Doctor of Physical and Mathematical Sciences (1991), a member of the International Astronomical Union (1993) and the European Astronomical Society (1993). He is also a science fiction writer under the pseudonym Vladimir Khlumov and a member of the Union of Russian Writers. ↑ "Lomonosov". Random House Webster's Unabridged Dictionary . 1 2 Menshutkin 1952, p. 11. 1 2 3 Menshutkin 1952, p. 12. ↑ Menshutkin 1952, p. 13. ↑ Galina Evgenʹevna Pavlova; Aleksandr Sergeevich Fedorov (1980). Mikhail Vasilievich Lomonosov: his life and work. Mir. p. 161. The atheistic direction of Lomonosov's scientific and artistic creativity was not always consistent. His world outlook, just as that of many other representatives of the age of enlightenment, possessed elements of deism according to which God, having created the universe, assumed no control over its development which was governed by the laws of nature. Lomonosov's deism was no chance factor. As Karl Marx aptly put it, deism was the most convenient and easiest way for many materialists of the 17th-18th centuries to abandon religion. ↑ Andrew Kahn (2008). Pushkin's Lyric Intelligence. Oxford University Press. p. 130. ISBN 9780191552939. No atheistic conclusions spring from 'The Orb of Day has Set' to reverse Lomonosov's deism, but the poem still intrudes a painful gap between man and nature. 1 2 Menshutkin 1952, p. 15. ↑ Menshutkin 1952, p. 16. ↑ Menshutkin 1952, p. 20. 1 2 Menshutkin 1952, p. 17. ↑ Menshutkin 1952, p. 23. ↑ Menshutkin 1952, p. 24. 1 2 3 4 5 6 7 8 9 Menshutkin 1952. ↑ Pavlova, Galina E., and Fedorov, Aleksandr S. Mikhail Vasilievich Lomonosov: His Life and Work (English Translation). Mir: Moscow, 1980. ↑ Menshutkin 1952, p. 120. ↑ Pomper, Philip (October 1962). "Lomonosov and the Discovery of the Law of the Conservation of Matter in Chemical Transformations". Ambix. 10 (3): 119–127. doi:10.1179/amb.1962.10.3.119. ↑ Lomonosov, Mikhail Vasil'evich (1959). 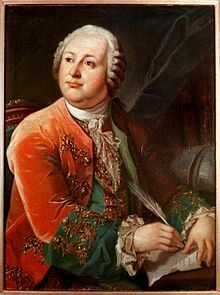 Mikhail Vasil'evich Lomonosov on the Corpuscular Theory. Translated by Leicester, Henry M. Cambridge, Massachusetts: Harvard University Press. pp. 56–57. ↑ Shiltsev, Vladimir (March 2014). "The 1761 Discovery of Venus' Atmosphere: Lomonosov and Others". Journal of Astronomical History and Heritage . 17 (1): 85–112. Bibcode:2014JAHH...17...85S. ↑ Elena Lavrenova. "Lomonosov biography". Foxdesign.ru. Retrieved 2 May 2011. ↑ "М.В. Ломоносов: к 300-летию со дня рождения". narfu.ru. Retrieved 2 May 2011. ↑ "М.А. Безбородое М.В. Ломоносов. Фабрика В Усть-Рудицах". Grokhovs1.chat.ru. 5 December 2001. Retrieved 2 May 2011. ↑ Sutherland, Christine (1984). The Princess of Siberia: The Story of Maria Volkonsky and the Decembrist Exiles. New York: Farrar, Straus and Giroux. ISBN 978-0-374-23727-1. ↑ Hamilton, Simon. "A Rambling Dictionary of Tallinn Street Names". Archived from the original on 26 June 2011. ↑ Russian floating nuclear power station undergoes mooring tests, NuclearPowerDaily.com, 7 July 2016, accessed 25 July 2016. ↑ "Work starts on on-shore infrastructure for Russian floating plant". World Nuclear News. Retrieved 4 January 2019.